I just received the most disgusting political mailing I have ever seen, courtesy of Tom Delay. It is a blatant attempt by this ultra-rightwing Texan to influence the upcoming Iowa Presidential caucuses. I have scanned the 21 page document and produced a downloadable 1.4Mb PDF so you can see it for yourself. This 20 page bulletin from Rev. Lou Sheldon of the “Traditional Values Coalition” came under a cover letter from Tom DeLay. There ought to be a law against Members of the House meddling in politics outside their district. Maybe there is a law, I don’t know, but if there isn’t, there ought to be. DeLay won’t be satisfied until the entire country is reshaped into a conservative rule under a christian god. And there’s where I really got irritated. The Sheldon letter opens by addressing me as “Dear Christian Friend.” How do I get on these mailing lists? I am neither a christian, nor a friend of conservatives. From there, the letter is 100% lies. I spent a few moments analyzing some of the lies, and when I got to their assertion that the 9th Federal District Court ruled “the Pledge of Allegiance is unconstitutional because it contains the phrase ‘one nation under god’…” my head just about exploded. No, the Pledge is not unconstitutional, it can be recited in the schools as long as it omits “under god.” Unfortunately, most Iowans are unsophisticated enough to be duped by these lies. 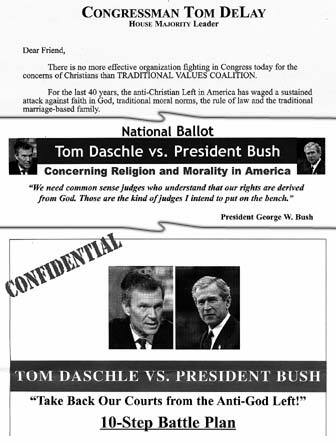 This nasty propaganda piece lays the blame for all evil at the feet of Tom Daschle, it claims he blocked Bush’s radical conservative judge activists from confirmation, preventing the Religious Right from assuming their god-given place as rulers of the USA. It spends much time slandering the ACLU for their defense of Bill of Rights and the Separation of Church and State. I guess religious activists have no use for the US Constitution. There is so much offensive garbage in this mailing, I cannot even begin to describe it. I encourage you to read it for yourself, and fight back against this attempt to manipulate voters with lies. I wouldn’t go so far as to say that “most Iowans are unsophisticated to be duped by these lies”. After all, the state has voted for the Democrat in four consecutive presidential elections (including Dukakis). Yeah, but they also voted for idiots like Jim Leach. What’s your point? I cannot think of a single state where the citizens haven’t elected at least one idiot. How does this reflect on the “sophistication” of a state’s populace? Moebius, since you live in Iowa City, in the most Democratic county in Iowa, it’s easy to assume other Iowans think like you do. You couldn’t be more wrong. Try zooming in on this map to see what I mean. But ultimately, the proof is the DeLay/Sheldon letter itself. If Iowans wouldn’t fall for this sort of obvious propaganda, they wouldn’t send it to them. Millions of dollars are spent on these targeted mailings, and they know that Iowans are the sort of people who are prepared to hand their money (and their government) over to theocrats on the flimsiest of pretenses.